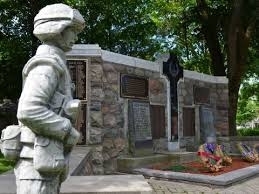 The Women's Memorial Association suggested a cenotaph and a memorial park to honour the soldiers who had fought in WWI. In 1919 they purchased the property at the corner of George and Frederick Street for $500. Money was raised to install the monument. The architect was J.M. Gibson and the stonemason was Ed Doherty. The government supplied the marble slab in the center of the Cenotaph with the cross embedded in it. 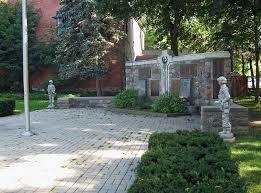 This cenotaph, unveiled in 1923, commemorates local soldiers who served in the First and Second World Wars. The approach is unique in that it was built with stones gathered from local farms. 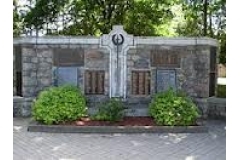 It was the first fieldstone monument built in Ontario and was described in the Toronto Star as a memorial whose "beauty cannot be equaled in the province."